From the kitchen of One Perfect Bite...I bought lamb chops for our holiday dinner, but because I was unsure of the number I'd be feeding, I ended up with more chops than guests at the table. I decided to grill the remainder of the chops tonight. Those we had for the holiday were delicious and I wanted to serve these with something that would compliment, rather than overpower, their marvelous flavor. I decided to make an endive and watercress salad and a very cheesy orzo pilaf. I can attribute the salad to Thomas Keller, but identifying the parentage of the orzo is next to impossible. Rachael Ray did a version of this recipe at least five years ago and since that time it has appeared in various guises on numerous cooking sites. I lack the wisdom of Solomon and have no easy test to establish paternity, so I'm just going to move along and pretend the orzo is a new version of rice pilaf. It is very easy to do and can be on the table in 15 minutes. Chances are you have all the ingredients you need to make this in your pantry, and, if not, they can all be found in any large grocery store. It is a perfect dish to serve with grilled meat or poultry and I know you'll enjoy it. Here's the recipe. 1) Bring broth to a boil in a large heavy saucepan. Add orzo and garlic and reduce heat to medium high. Simmer, uncovered, for about 7-8 minutes, stirring occasionally, until the pasta is tender, and broth is nearly absorbed. 2) Turn heat off, but leave the pan on stove. Add cheese and parsley and mix well. Season to taste with salt and pepper. Serve warm. Yield: 6 servings. What a great photo!! Can you believe I've never eaten lamb? I like this yellow looking pilaf, sound interesting! I think my monkeys would love this. Your orzo looks so delicious! I hope you had a wonderful Easter! I have to be honest and say that I had to google Orzo. Never heard of it but it sounds delicious. Will surely be trying this one. The Orzo dish looks so comforting and delicious! I adore Orzo and cheesy Orzo? Now I'm at heaven's door! Love your recipe and love the flavors you've weaved. Lovely! Can I ask you if the lemon slice is just for decoration or also for flavour? un piatto unico eccezionale!! complimenti! Orzo is one of those perfect foods. Quick and delicious. I have never done it with cheese before but I've got some in my pantry waiting for a purpose in life... as soon as I finish my lasagna... I'm ready to try this great looking recipe! Great photo. This is such a sunny looking dish. I love it. I love the ease of orzo and no matter where this recipe came from, it is a winner. Lamb chops are my preferred cut of lamb. Irzo has turned into my favourite side dish. I always forget about orzo as a side dish and I always have some. Tonight. So pretty. So full of flavor. Mmmmm, I love this easy and tasty dish. It has so much flavor and none of the "strange stuff" that my grandchildren like to pick out. Sounds delicious and easy and fast! I know my daughter would love it , she is a big fan of orzo! Plus I have some parmesan in the fridge waiting to be utilized! Thanks for the idea! I love creamy dishes they are so comforting and your's looks so simple to make. I love this recipe. Can't wait to make it for my husband. I have not been cooking all that much lately due to traveling but am itching to get back into my kitchen and grilling and playing with FLOUR:) Your passion for cooking always motivates me. What a lovely recipe. I'll be trying this soon! Thumbs up! I love Orzo and use it all the time;thank you for giving me another for my collection. Thank you for stopping by the blog. I am glad I read your intelligent and inspirational blog. I look forward to following you here. Cheers! By the way...Thomas Keller or RR...I'll go with TK. Mary-This will be on our dinner table soon! I am always looking for a good side dish. I missed the other versions--as far as I concerned, you are its "mother". Thanks! This reminds me of the orzotto I have a tendency to make far too frequently. Must have been perfect with those lamb chops! Myriam, I was able to get the translation. I think you will like this very much. I bet this was awesome with the lamb. Heh, I bet it was awesome by itself! Looks great. Orzo has always been a favorite, and everything (yes, everything!) tastes better with cheese! I love orzo, but I never know how to prepare it. This is a great idea! Looks delicious. I will have to try this pilaf. 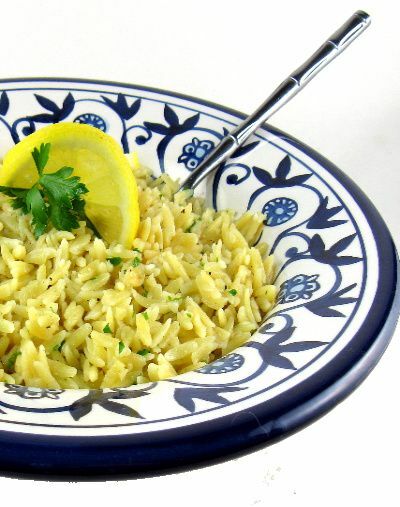 This looks great and brings back a lot of childhood memories as my mom made orzo often. You can't go wrong with a delicious orzo dish like this! orzo is such a comfort food for me, I just love it with anything. I know I would love this as a side dish! Wow, Mary, this looks amazing. Thanks for sharing. I really want to make it now. I love orzo and this looks great. I am sure it was perfect with the lamb. This dish is a favorite of mine. I admit to maybe putting in a bit more cheese (and I've thrown in some bacon or pancetta a time or two) and just calling it dinner! I am a fan of any orzo recipe and this looks like it would pair wonderfully with your lamb. Another great recipe. This orzo dish is perfect. And the lamb sounds devine! Any time I hear the word orzo or pilaf I salivate!!! This looks AMAZING! Now I HAVE to go get me some lunch! Love that your recipes are fresh, easy, and look delicious! Definitely want to try this one out! So happy to have stumbled across your blog. I like your style! !